Broforce is the ultimate nostalgia trip for anyone that grew up in the 80’s and 90’s. 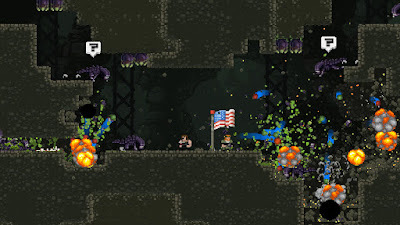 With classic 2D platforming / shooting similar to Contra or Metal Slug combined with familiar action movie heroes of the era, Broforce is just an absolute treat. Well, it’s a treat when it actually works. Unfortunately the PS4 release of Broforce has a lot of glitches and bugs and severe performance issues that have never been fixed. It’s a shame, too, because the game is spectacularly fun until you reach the latter third and it all starts falling apart at the seams. Broforce still may be worth a look as long as you know what you’re getting into, though, so continue reading our full review for all of the details. Broforce has you playing as a super team of badass heroes as they travel the world liberating poor defenseless countries in the name of ‘Murica. You fight increasingly tough human enemies before eventually fighting aliens and even the legions of Hell. The list of playable characters is basically a Who’s Who of Action Movies and includes the likes of Rambo, Robocop, John McClane from “Die Hard”, Ripley from “Alien”, Indiana Jones, Neo, Terminator, a Predator, The Bride from “Kill Bill”, and many, many, many more that are gradually unlocked as you play. All of the characters actually play remarkably differently from each other and use their signature weapons and attacks from their respective franchises. You don’t get to choose who you play as, though, and instead spawn as a random character or randomly change into someone else when you save trapped bros scattered around each level. Not all of the characters are equally useful and effective, however, and spawning as a character with the wrong abilities can make getting through a level tougher than it would be otherwise. Gameplay is pretty straightforward as each character has a standard attack, which may be a flamethrower, machine gun, shotgun, sword strike, or any number of other weapons depending on the character, as well as a limited special attack that includes grenades, calling in an airstrike, using a remote control missile, and many more. The game plays just like Contra or Metal Slug, basically, so you move from left to right, do some light platforming, and kill everything you see. There are also captured allies that you can free who, in addition to changing the character you play as, also give you an extra life. You’ll need those extra lives because every character only has 1HP and if you take any damage at all, you’re dead. 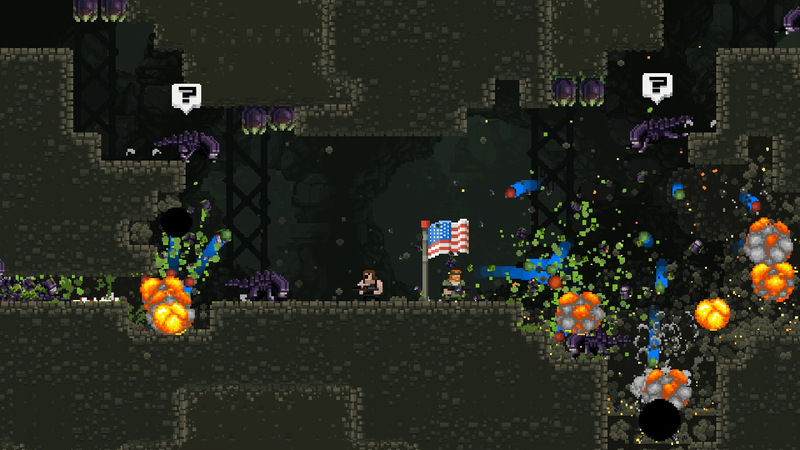 Broforce has another trick up its sleeve, however, and that is the fact that the levels are almost entirely destructible. You can actually avoid enemy encounters and traps and particularly tough sections of levels by simply digging around them. This gives the game a surprising layer of extra depth because you have almost limitless ways of tackling any situation. You can even manipulate boss fights by digging your way into an advantageous position where the boss can’t hurt you. 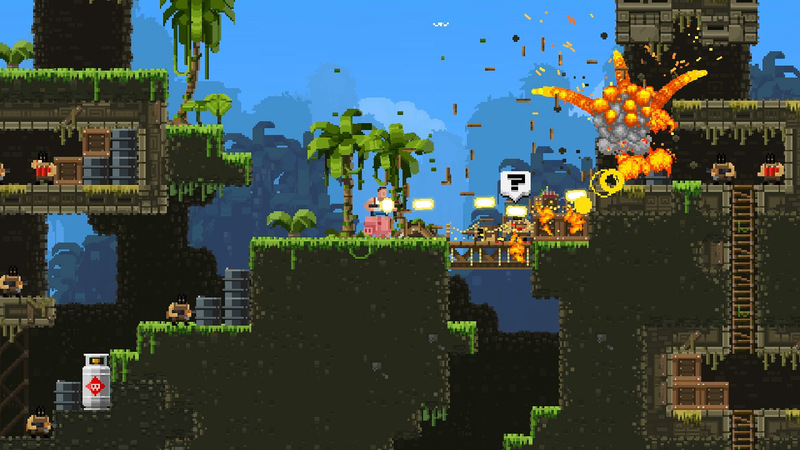 Anything is fair game in Broforce, which is why it’s so fun. And because it’s so fun is also why the prevalent glitches and performance issues on the PS4 version are so disappointing. The game launched on PS4 in March 2016 with a laundry list of issues that have never been fixed. Issues include the game not loading properly, co-op not working properly either online or locally (but sometimes it does so who the heck knows why), and the game isn’t actually beatable for many people because the final boss fight has a major glitch. The framerate also becomes a major problem later in the game as the performance can slow to a crawl when a lot of enemies and explosions are onscreen. Broforce on PS4 is a disaster that has been abandoned by the publisher and developer. 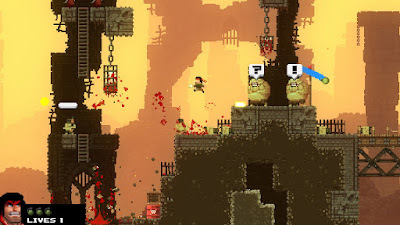 While Broforce on PS4 is a mess, it is also ridiculously fun when it works. The retro 2D sprite presentation is cool, the characters are awesome, the gameplay is challenging and fun and satisfying and the freedom to improvise is wonderful. I played through it solo and had a great time up until the last chunk where the framerate went down the toilet and the final boss glitched out on me. Before that, however, was several hours of really enjoyable gaming. I bought Broforce during a PSN sale for under $7 and would say I’m fairly satisfied with my experience for that price. I wouldn’t recommend it at the full $15 MSRP, because of all of the obvious issues, but if you can buy it on sale and understand that it won’t be a totally smooth ride going in, it is worth a look.